Number of years the United States could meet its energy needs by burning all its trees: 1. Ironically, just as delegates in Copenhagen are ramping up efforts to preserve forests globally to slow global warming, a technology that has the opposite effect is poised to wreak havoc on forests around the world. It’s called biomass burning: chipping up trees and burning them in power plants to create electricity. The idea is that if you replace burning fossil fuels with burning wood the planet and climate will be better off. The concept that burning anything is good for the climate seems a little suspect, but could a civilization with six billion people, spaceships, and microwave ovens power itself by burning trees? Probably not. But after being erroneously labeled carbon neutral at Kyoto biomass burning is ramping up all over the world in the name of green energy. 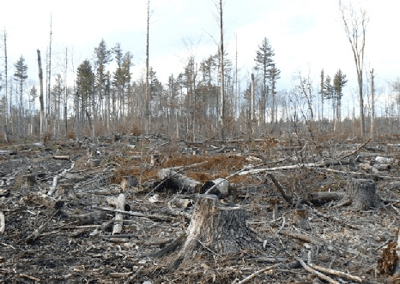 If delegates at Copenhagen fail to correct this error and remove woody biomass burning from the roster of technologies deemed "carbon neutral" the net result could be not to save the forests, but to destroying them. This loophole gives oil companies, power plants and industries that face tighter pollution limits a cheap, yet erroneous, means to claim reductions in greenhouse gas emissions. According to a number of studies, including one by a U.S. Department of Energy lab, applying this incentive globally could lead to the loss of most of the world’s natural forests as carbon caps tighten. The loss of most of the world’s natural forests? Those who think the planet can survive THAT raise your hand. Can’t find any? 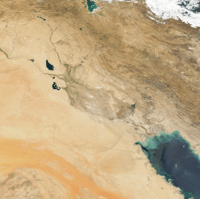 This used to be the lushly forested place called Mesopotamia, the Cradle of Civilization: modern day Iraq, Iran and the Middle East. I would be a little cranky too if my trees we’re all gone. Biomass Burning Delusion # 1: Burning trees doesn’t produce carbon dioxide. Burning any carbon based fuel produces carbon dioxide. That’s what burning is, carbon plus oxygen yields heat and CO2 and some other stuff called pollution. 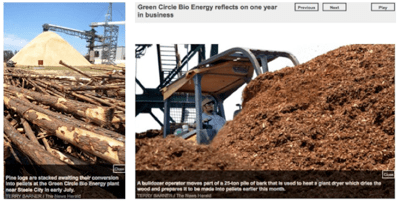 Woody biomass burning as it turns out produces more carbon dioxide than burning fossil fuels. You can pass laws and sign treaties but when you take a match to wood it releases carbon dioxide. "Biomass burning produces fifty percent more carbon dioxide even than coal because it burns less efficiently," say Biologist Rachel Smolker of U.K. based Biofuelwatch. Some would say three times as much, others argue that wood and coal are closer to equal in CO2 production. But there is certainly no fuel WORSE than wood burning carbon dioxide wise. Biomass Burning Delusion #2: When you cut and burn a tree it invigorates the growth of the forest which then takes up the CO2 you released by burning the tree. Here’s what really happens: During simulated timber harvest, on-site carbon storage is reduced considerably and does not approach old-growth storage capacity for at least 200 years. Turns out as long as trees are alive they are growing and storing CO2 in roots, branches, trunks and leaves. 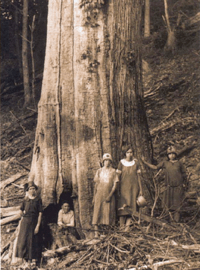 It makes sense that a one-ounce seedling cannot replicate the carbon uptake of a multi-ton tree, not for centuries anyway. Second growth can seem vigorous because the replacement trees mine the nutrients from pervious generations of trees stored in the soil. And after the third or fourth cutting? All bets are off. "People believe there is some magic in nature," said Smolker. "That you can keep taking and things will grow back." Apparently not. In many places already industrial monoculture forests are already being fertilized and treated with pesticides and herbicides. Biomass Burning Delusion #3: If we don’t burn trees they will eventually just rot and release their carbon anyway. The proof? It’s called coal. Millions of generations of plants and trees have taken in carbon from the air and deposited it as mountains of coal. It’s what trees and plants do. Because trees and plants took the CO2 out of the atmosphere we have the nice comfortable climate we enjoy today. It’s not their fault we’re releasing everything they worked so hard to lock away, and if we cut then down they are going to have that much more difficult of a time soaking the carbon back up. Biomass Burning Delusion # 4: Only "waste wood" or "certified sustainable" wood will be burned for biomass. I asked a fellow who oversees the State Forest where I live, some of which you can see in the photo below, how much "waste" per acre could be gotten from land like this for biomass burning. "There’s not enough waste to bother with," he scoffed. 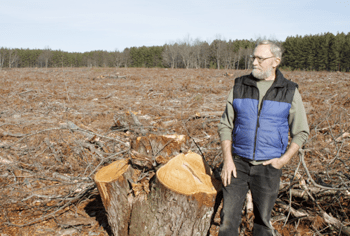 "We’re talking whole trees,"
"How much forest is available to be used for biomass?" I asked. "None," he answered. In a state where the governor has proclaimed, "we have plenty of biomass, come and get it!" a fellow could get fired for saying something like that. He went on to describe a logging rotation that would have the forest completely cut in fifty years–a long time for humans, but the blink of an eye for the forest. Randy Bond enjoying a sustainable Michigan forest near his home. Here is the frightening thing. Notice what’s coming up beneath all that logging slash? Nothing. Unless men plant more pines this forest is kaput after only two cuttings. And now here come the biomass plants. NOT a redwood, but an American chestnut tree in Tennessee. Seen any trees this large recently where you live? Biomass Burning Delusion #5: Biomass burning is "local" energy. That’s right, an international trade in trees for burning has sprouted up. A recent Bloomberg headline called wood the "new coal." "Wood is becoming a hot commodity in a new low-carbon world," the article proclaimed. 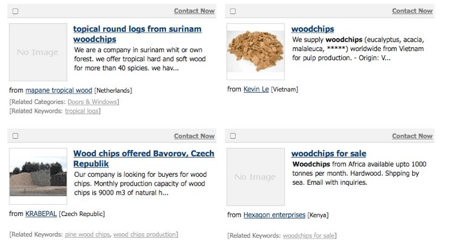 Indeed you can find trees including tropical hardwoods and softwoods for biomass burning for sale from every continent. This is the opposite of the local biomass miracle we’ve been promised. Simone Lovera of the Global Forest Coalition in Paraguay told the UK newspaper The Independent, "Europe is going to cook the world’s tropical forests to fight climate change; it’s crazy." Of course just in case Africa, Asia, Indonesia, and South America don’t have enough trees to fuel the biomass burning fantasies of Europe, a nice company from Sweden called JCE Group AB, is helping the people of Florida liberate their extra forests. 150 truck loads of trees PER DAY are ground up and shipped to Europe for biomass burning to the tune of 400,000 metric tons per year. Of course they don’t even bother to pretend it’s waste wood. Biomass Burning Delusions # 6 and #7: That biomass is biomass; and "biomass" burning pollutes less than fossil fuels. Here in northern Michigan at least two of our "biomass" plants burn old tires. Others shovel in old houses and creosote soaked railroad ties. I don’t know what’s "bio" about all this crap but the energy you get is considered carbon neutral and renewable. Burning anything pollutes, and burning wood, while putting out fewer pollutants such as mercury and sulfur dioxide than coal, also puts out even more fine particulates that are hazardous to human health as well as volatile organic compounds, nitrous oxides, and unusual things like aluminum. Biomass plant advocates often claim they will use advanced technology like gasification, co-generation and scrubbers. The reality is that whatever applies to "clean wood" also applies to "clean coal." And of course since biomass also can include tires, who knows what the heck is in the air. That’s not all that get’s burned. Even the world’s largest trash incinerator in Detroit is considered green energy. When someone tells you that biomass plants meet air pollution standards and are therefore "clean" remind them that so does even the world’s largest green energy waste incinerator, as do all coal plants. Biomass Burning Delusion #8: Renewables are ready to power the world. Maybe you’ve seen this headline: "Google’s $10 Million Investment in Geothermal Indicates the Green Revolution is Underway." Sounds great, doesn’t it? But did you see THIS headline: "Swiss geothermal power plan abandoned after quakes hit Basel." It’s been known for several years that geothermal drilling can cause earthquakes but unbelievably projects in California went right on ahead. Just this week Al Gore told the world that geothermal had unlimited potential. And maybe it does, but right now it’s not ready for any role. The California geothermal project after collecting tens of millions in government grants and private investments shut down last Friday over problems getting the technology to work, as well as earthquake fears. What about tide and wave power? After numerous setbacks and tens of millions of dollars a tide power project in New York barely produces enough electricity for a single grocery store. Off the coasts of Oregon and California wave power equipment has been beaten to death by the ocean. "It’s frustrating sometimes as an ocean energy company to say, yeah, your device sank," said Jason Bak. Maybe wind, tide, and geothermal might prove useful someday but right now they are not anything we can rely on. But surely wind and solar are better? Yes. They both produce electricity. But how much and how useable? One of the little known secrets of the renewable energy movement is that variable energy like solar and wind are not terribly useful in a modern energy grid. Every light bulb and computer in your life has to have EXCATLY the right amount of electricity precisely when you turn them on. Only base load power provided by fossil fuels, nuclear or hydroelectric can ramp up and down to meet demand like that. Solar and wind march to their own drummer and are called variable power. How much variable energy can a grid accept? Around ten percent, twenty percent tops it appears. For instance, only about 16% of Denmark’s electricity is produced by their 5500 offshore wind turbines (pdf). But even that is only possible because Denmark is connected to the huge European grid of nuclear, hydroelectric and coal fired base load power plants. Without those plants Denmark’s wind power would be useless. Put another way, how much useful electricity would Denmark be getting from their wind farms if the coal, nuclear and hydroelectric plants shut down? Same everywhere from Denver to Dubai. You cannot run a grid on variable energy. And now you see the reason why Denmark and Europe are scarfing up the forests of the world to fuel their biomass plants and the delusion that they are obtaining a huge fraction of their energy from renewable, carbon neutral sources. Biomass burning may be base load but it’s fools gold. It’s not sustainable, it’s not carbon neutral and it’s not going to work out. But here’s the result of mandating "renewable" energy and allowing biomass burning to be part for the mix. Where I live in Traverse City, Michigan we have one (broken for the moment) wind turbine, a small wind farms in another county we can buy a little power from–and plans to build a wood-fired power plants, one of a dozen already operating or planned for Michigan. The director of our local electricity producer said about biomass burning, "Solar and wind are variable power and our customers need base load and biomass is the only base load renewable." The confession that there is no renewable base load energy and so it all comes down to burning trees is an astounding one. Any renewable energy target while biomass burning is on the table means the renewable energy mix will be heavily skewed toward biomass because it provides base load power and is far more useful than wind or solar. (And far dirtier.) The presence of biomass in the green energy mix prevents utilities, communities and corporations from working harder to develop and deploy technologies that might actually work and help overcome the limits of variable energy. If recent reports hold true you, the delegates at Copenhagen, are to be lauded for recognizing that forests are the planet’s last, best hope for stopping climate change. Your quest to save the forests to mitigate climate change will fail though unless you also banish woody biomass burning.. I also propose something new: if you get a carbon credit for planting a tree, you have to get a carbon punishment for cutting one down and halting it’s uptake of CO2, and another punishment for burning the tree since you now released it’s CO2 when we can least afford. These punishments combined with credits for leaving forests uncut could do the trick along with banishing woody biomass buring. The reality is that we got into this mess because we have pigged out on a one-time inheritance of ancient biomass in the form of fossil fuels. We can’t get out of this by burning more stuff and rebranding it green. Twenty-five million Americans in the 1800’s ran through most of the trees of North America to heat homes, power trains and build cities. It’s not going to work for 300 million American’s with far greater energy needs. A civilization trying to run Chevy Volts and a billion televisions on trees is doomed. Burning trees will make global warming worse, possibly a lot worse. Let’s put a stop to it. The time is now. What other time will there be? Cutting them down and burning them? I am going with the letting the trees grow thing. 1) Saving our forests (and that doesn’t mean more tree plantations) is the best way to stop global warming and save humanity. 2) Deforestation is just as likely to result in the end of humanity as climate change and it’s right on track to do so. 3) Burning things is the most insane way to stop global warming since doctors drilled holes in skulls to let the demons out and gave you a bill for it. 4) There is no extra in nature and there is not enough "bio" on the planet to be burned, turned to ethanol, biodiesel or jet fuel, or bio-charcoal. 5) Woody biomass falsely deemed renewable energy increases the CO2 in the atmosphere, destroys forests, and prevents renewables from being fully explored. 6) Geo-engineering the forests, atmosphere or oceans to stop global warming isn’t going to work. We can’t even figure out how to stop carp from taking over a river or bugs from eating a forest. 7) There is a possibility that the only way to heal the planet is to get control of our own numbers and consumption while letting nature do the work she has done for three billion years: run the planet.